County Roscommon (Irish: Contae Ros Comáin) is situated in north west part of Midlands and has the geographical centre of Ireland. It's a quiet and mainly flat region mostly dominated by bog and pasture, noted for the quality of their cattle and sheep. 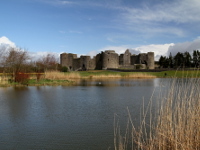 Roscommon Town is home to a number of buildings and features of historical and archaeological significance including Roscommon Castle and Abbey and the Old Roscommon Gaol. 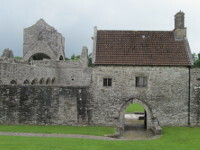 The Boyle Town located in the northern part of County Roscommon has one of the best preserved Cistercian abbeys in Ireland, founded in the 12th century - Boyle Abbey and the restored Georgian Mansion from beginning of 18th century - King House. 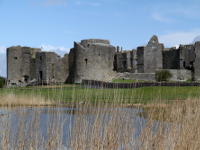 It's good base to explore attractions of this region like Curlew Mountains, Lough Key, Carrowkeel Megalithic Cemetery or the popular fishing lakes of Lough Arrow and Lough Gara. 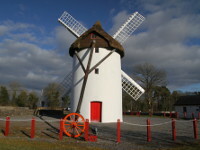 The Strokestown located between Boyle and Roscommon is also worth to pay a visit. There is an 18th-century Georgian Palladian mansion preserved with its original furnishings surrounded by stunning park with the longest herbaceous border in Ireland. The Strokestown House is also home for The Irish National Famine Museum.